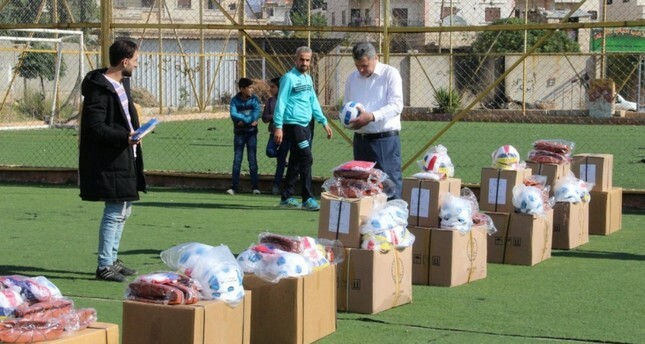 An official from Turkey's southern Hatay province distributes football and table tennis equipment as well as backpacks and jerseys to students in Afrin, Feb. 7, 2019. Turkish officials delivered sports equipment Thursday to several schools in northwestern Syria's Afrin. After a Turkish military operation drove out the PKK-affiliated People's Protection Units (YPG) from the region in 2018, Turkey has continued its efforts to help young people in the district. Turkey's official from the southern Hatay province distributed football and table tennis equipment as well as backpacks and jerseys among students. Turkey has also opened football and basketball training programs for students and organized sports competitions across the district. It is also renovating two football pitches and one sports complex. Afrin had been a major hideout for the YPG since July 2012, when Syria's Bashar Assad regime left the city to the terror group without a fight. Local people, however, suffered under the oppressive terrorist organization. With the objective of re-establishing security and stability along Turkey's borders and protecting Syrians from oppression, Turkey launched Operation Olive Branch on Jan. 20, 2018 to remove YPG forces from Afrin. The Turkish military and Free Syrian Army (FSA) entered Afrin town center and liberated it from terrorists on March 18, 2018. Following the operations, Turkey has also been involved in efforts to rebuild the town's infrastructure, as well as health and education institutions. Turkey has opened its doors to more than 3.5 million Syrian refugees since the beginning of the civil war. At the end of last year, Turkey's Interior Ministry said that nearly 300,000 Syrians had returned to their homes after successful Turkish counterterror operations in the region.